I guess I don't understand why some obvious off-topic questions seem to be welcomed and some others that are no more off-topic are banned. A while back, in this post (How to set a custom page to replace the default Firefox New Tab page), I asked why a question of Firefox usage was asked in askubuntu, rather than a firefox forum, and the tide seemed to go against me, with the accepted answer getting upvoted (https://meta.askubuntu.com/a/14383/39753). OK, so I helped someone with a problem recently (https://askubuntu.com/q/751984/39753) and the answer sort of showed it to be off-topic, but the question itself seemed to fit into the on-topic guidelines of getting an app (apache) to work with Ubuntu. Yet the poor poster was downvoted a lot, and the topic was declared to be off-topic. Why is that any more off-topic than the many questions about virtualbox, or even these, ironically, by one of the users (muru) who voted for it to be off-topic: https://askubuntu.com/a/680226/39753 or How to set a custom page to replace the default Firefox New Tab page? The reasons given are not very helpful to a new user, and tends to discourage them from posting questions because it's not clear to them what is considered on-topic. It's apparently not really clear to anyone. I think gray areas such as this question should be given more leeway, and should be allowed rather than disallowed if it's not clearly off-topic. The posted question I'm referring to had code in it which was 100% correct. It worked perfectly as is on my working system. 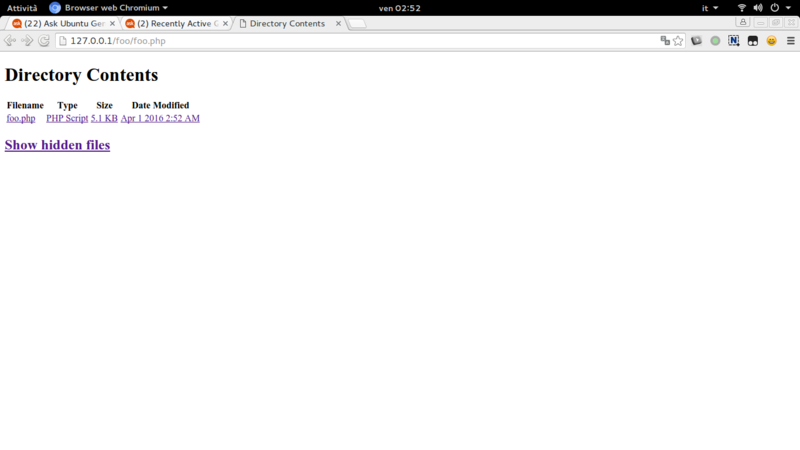 But the code did not work correctly on the OP's system, because Apache was not set up correctly to recognize php code. So, Apache interpreted it as pure HTML code, and simply ignored the php. I thought I explained this, but either I didn't, or everyone saw all the code and assumed it was a programming problem. If the OP had realized what was happening, and simply said the php code was being ignored without posting the code, I suspect the question would not have been voted off-topic. Due to to the continued inability of people here to even understand the actual point of my question, and can't seem to grasp the difference between a question about code, and a question about why the (100% correct) code doesn't work in an app, and who then get offended and go back to my correct answer and downvote it, insisting it is incorrect without understanding why it is correct, I deleted my answer. Since everyone insists it's wrong, and the question is off-topic, and the original poster doesn't even care to take time to understand what happened, it should be no great loss. To those of you who think I deleted it due to lack of rep points, you don't know me very well - I'm not a rep whore like some of you obviously are. So, congratulations; you won. I also won, as I can now make better use of my free time than trying to help ungrateful users. I think anyone who had tried at least once to run a webserver + PHP instance would agree that what's shown in OP's picture could very likely have been a sign of Apache / PHP misconfiguration (or for that matter simply PHP not running). However indeed not everyone has the minimal degree of experience with webserver + PHP instances to understand that. If you add a wall of possibly bugged PHP code to that you'll understand why people may be scared off by that. This and the fact that we're flooded with off-topic questions don't help in keeping a straight mind sometimes. And sometimes the stance becomes "when in doubt, close". It's not something we shoud pursue, but it inevitabily happens. And I'm sure I've made the same mistake sometimes. But yes, that was an error. That question shouldn't have been closed without a basic debugging along the lines of "Is PHP running?". Since the issue is fixed (OP is happy) and it's not clear what caused it, I won't vote to reopen it. Just out of curiosity, I've tested OP's code: it works. You read it in a way that is naturally favourable to you who posted the answer. To me, it seems the only reason they thanked you was that you are the only responder. And if you look at the screenshot, you will see the URL: localhost/teste2/index.php. Note: index.php and localhost. This was not an HTML file and not a PHP file opened directly in the browser. This was a PHP file served by a web server. That's to say, we still don't know what went wrong. Your answer is wrong. And so this once again becomes a PHP debugging problem. You then go on to assume that this was because Apache wasn't properly set up to recognise PHP. Probably, but we don't have any additional evidence for that either - OP doesn't know. Seems to me, you know a lot more about this problem than the OP tells us. Do enlighten us with how you gained this information. By the way, thanks for notifying. I upvoted your answer since it could be a solution. Now that it's turned out to be wrong, I'm retracting that. And since you have a personal problem with me, let me see. How do I install the latest version of Git with apt? - A software installation problem. If that isn't specific to Ubuntu, I don't know what is. If OP had asked how to install the latest version of PHP (look at the revision history), that would have been no less on-topic. Why is there an inconsistency in base64 output? - A problem with command-line tools, that doesn't involve any programming. See How strict should off-topic questions be flagged as such? and Are bash/shell scripting questions on topic? The Firefox question is on topic because Firefox is component of Ubuntu, so usage of Firefox (and other applications too) is also usage of Ubuntu. The PHP question is off topic because it is a generic programming question, it is not related directly to Ubuntu and would be better off on a programming site as it is not Ubuntu specific. Yet the poor poster was downvoted a lot, and the topic was declared to be off-topic. I would not call 2 down votes and 1 up a lot. If Ubuntu is running in VB or even if VB is running on Ubuntu, then this would be on topic as it would be a question specifically about the usage of Ubuntu or using an application in Ubuntu. To sum this up, we are not a programming site, we do technical support for Ubuntu. Programming (with the exception of system scripts) are off topic here as we need to keep the questions under control and a clear focus on what the site is doing, there are many sites that will help with different coding issues. I was chastised in the past for saying app-specific questions were off-topic, since the app (in this case, Apache) comes with Ubuntu and may have Ubuntu-specific issues. To me, and others too I guess, the question is not directly about apache, it is about a specific bit of code, that is what makes it off topic. Of course every thing is open to users interpretation, so if you think it should be reopened, cast a reopen vote and give your reasons, if others agree the question will be reopened. From my point of view, asking for something that is directly related to Ubuntu, is allowed here. For example, LAMP stack. I've had countless errors with PHP and Apache, in ubuntu machine. I don't think that's a problem if I asked here. Same goes with firefox. Firefox is the part of ubuntu, and if ubuntu make firefox 'different' from another firefox, I don't think it is wrong to ask here, even if the newcomer from google implement it in Firefox for Windows ._. Asking for PHP script here isn't directly related to ubuntu. Yes, PHP is one component of the LAMP stack, but doesn't mean we should cover every script. Then, are we supposed to be firefox's bug tracker, because sometimes it simply hangs? Good off topic questions: migrate rather than close? Where do we exactly draw the line on a question, being off-topic?